Major General Joseph Saidu Momoh, OOR, OBE (January 26, 1937 – August 3, 2003) served as President of Sierra Leone from November 1985 to April 29, 1992. Joseph Saidu Momoh was born on January 26, 1937 in Binkolo, Bombali District in the Northern Province of British Sierra Leone to Limba parents. In the early 1940s, his family moved to Freetown then Wilberforce. His family were Christians. From 1951 to 1955, he was educated at the West African Methodist Collegiate School. Momoh was very athletic and enjoyed playing tennis, basketball and volleyball. He played competative football for the Young Stars FC at Makeni and Blackpool FC. He completed his education at the Government Clerks School, Technical Institute. In 1956, Momoh worked as third grade clerk in Sierra Leone's civil service. He resigned from this position in 1958 in order to joined in the armed forces. Momoh's military career began in 1958, when he enlisted in the Royal West African Frontier Force (RWAFF) as a private. He trained at the Regular Officers Training School in Ghana and the Nigerian Military Training Academy. He then travelled to the United Kingdom to train at the School of Infantry at Hythe and the Mons Officers Cadet School in Aldershot. He was commissioned as second lieutenant in the Royal Sierra Leone Military Forces in 1963. He was elevated to the rank of major and given command at Moa Barracks, Kailahun. In 1969, Momoh became lieutenant colonel and commanding officer of the First Battalion. A year later, he was promoted to the rank of Colonel. He was appointed deputy force commander in 1971 by President Siaka Stevens, after a coup attempt by Brigadier John Bangura.. Momoh succeeded Bangura as force commander in November 1971. In 1974, he was appointed minister of state with cabinet status. He became major-general in 1983. In 1985, Momoh became secretary-general and head of the All People's Congress (APC). The same year, he succeeded President Siaka Stevens by becoming the only candidate in a one-party election in the form of a referendum on 8 October 1985. Momoh became the second President of Sierra Leone and he served from November 28, 1985 to April 29, 1992. Momoh declared a state of economic emergency early in his rule, granting himself greater control over Sierra Leone's economy, but he was not regarded as a dictator. Instead, his people viewed him as far too weak and inattentive to the affairs of state, allowing his notoriously corrupt advisors to manipulate matters behind the scenes. Momoh has inherited a disintegrating economy from his predecessor and he was unable to stop the trend. The country's currency decreased in value. Sierra Leone reached the point under President Momoh where it could not afford to import gasoline and fuel oil, and the country went without electricity for months at a time. On 23 March 1987, police reported that a group of conspirators was plotting to assassinate Momoh and stage a coup d'étet after they raided a house in Freetown and discovered a cache of weapons, including rocket launchers. James Bambay Kamara, the formidable Inspector General of the Sierra Leone Police, gave the order to arrest First Vice President Francis Minah, G.M.T. Kaikai, Jamil Sahid Mohamed and fifteen others. Minah was a personal friend of Momoh and while he did not personally believe that Minah was involved in the plot, he did not want to oppose Inspector General Kamara. Momoh did not intervene on behalf of Minah. The Treason Trial went on for five months until October 1987 when the jury delivered a guilty verdict. The former First Vice President and 17 others were convicted of treason and sentenced to death. Jamil Sahid Mohamed escaped to Lebanon where he remained in exile. They were executed on warrants signed by Momoh. The SCIPA Group was an Israeli mineral company led by Nir Guaz that arrived in Sierra Leone in 1989. SCIPA bought its way into Momoh's favor by providing the government with loans and enabling Sierra Leone to enter into negotiations with the International Monetary Fund. On Christmas Eve 1989, Momoh had Guaz arrested, charged with economic sabotage and deported from Sierra Leone. 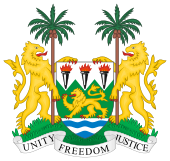 In September 1991, after the start of the Sierra Leone Civil War, Momoh ushered in a new constitution which dismantled the one-party state established in 1978 and instituting multiparty democracy. He also played a great part in dissolving tribalism. However, Momoh's efforts at reform came too late to rescue Sierra Leone from chaos. He was overthrown in a military coup staged by Valentine Strasser, a 25-year-old army captain, in April 1992. In April 1992, a group of young soldiers marched to Freetown from the war front where they had been fighting the Revolutionary United Front (RUF) led by Foday Sankoh. Incensed by terrible working conditions, unpaid salaries and a lack of government support they staged a coup d'état. On 29 April 1992, the soldiers, led by Captain Valentine Strasser announced the military coup on the radio. Momoh fled to Guinea and sought political asylum. Momoh was granted political asylum in neighboring Guinea by President Lansana Conté. He took up residence in a mansion in Nongo Tadi, Conakry. Momoh died on August 2, 2003, at the age of 66, Momoh spent the last years of his life as a guest of the military government in neighboring Guinea, where he died in exile in 2003. Ironically Foday Sankoh had died a few days earlier. In 1971, Momoh was made an Officer of the Most Excellent Order of the British Empire. He was decorated as an Officer of the Order of the Rokel in 1974 by President Siaka Stevens. ^ a b c d e f g h i j k l m n o p q r s t u v w x y z aa Jalloh, Alusine, (2018). Muslim Fula business elites and politics in Sierra Leone. Rochester, NY: University of Rochester Press. p. 176. ISBN 9781580461146. OCLC 1006316899. ^ a b c d e "Former Vice President Convicted Of Treason, Sentenced To Death". AP News. Retrieved 2018-07-09. ^ a b c d Berewa, Solomon E. (December 2011). "A New Perspective on Governance, Leadership, Conflict and Nation Building in Sierra Leone". AuthorHouse. Retrieved 2018-07-10. ^ a b c Pham, John-Peter (2005). "Child Soldiers, Adult Interests: The Global Dimensions of the Sierra Leonean Tragedy". Nova Publishers. Retrieved 2018-07-10. ^ a b c d Mansaray, Ibrahim Sourie (2013). "Was the 1992 coup a blessing or a curse for Sierra Leone?". Retrieved 2018-06-17. ^ a b "On Ex-President Momoh's will. Wife reveals it all". cocorioko.net. 2005-12-24. Retrieved 2018-06-18. Tuchscherer, Konrad. “Joseph Saidu Momoh,” Encyclopedia of Modern Dictators, ed. by Frank J. Coppa (New York: Peter Lang), 2006, pp. 189–191. Tuchscherer, Konrad. “Joseph Saidu Momoh: A Legacy of Missed Opportunity,” Awoko (Freetown, Sierra Leone), 25 July 2003, p. 7. Tuchscherer, Konrad. “Joseph Saidu Momoh: Human Rights,” Daily Observer (Banjul, The Gambia), 14 August 2003, p. 12. This page was last edited on 2 March 2019, at 03:54 (UTC).